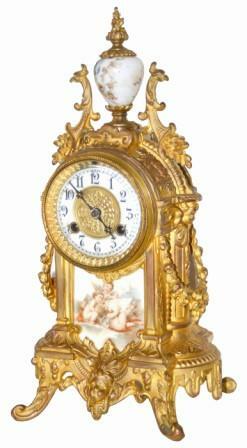 Waterbury Clock Co. metal cased mantle clock, "Sartoris", ca 1906. Waterbury called the finish, "Rich Roman Gold Plated". It is probably a brass case with gold plating. The finish is still very nice but on a few spots you can see some copper shining thru. The case is 14" high and overall in very good condition, with one unfortunate problem. The porcelain urn on top has some damage, cracks and repairs, but only on one side. If you leave the damage turned to the back, you do not see it, if you turn it to the front you will be sorry. The repairs were not professionally done but still they are not bad. Porcelain insert on the base is excellent, the dial ring has hairlines and a repair at 8 o'clock, correct hands, fine beveled glass in the sash, and everything else is very nice. 8 day movement is clean, signed, running, and striking half hours and hours on a gong. Correct hinged and latching metal back door. Ly-Waterbury No. 1228. Would be a $600 plus clock if not for the minor damage.